Wasps or yellow jackets will try to rob honey from the hives as fall approaches. It’s not uncommon to see honey bees battling with wasps at the entrances to the hives. The wasps, if numerous, can also be a major annoyance to beekeepers. That’s why wasp traps like this one can come in handy. A homemade version consisting of a cut up plastic bottle might work just as well, but I bought this wasp trap yesterday at Canadian Tire for $8.99 and it’s already paid for itself as far as I’m concerned. I’ll dump out the dead wasps before I go to bed tonight and put it out again with some fresh sugar water and jam tomorrow morning. I saw a single honey bee trapped inside with the dead wasps. That’s acceptable collateral damage. I plan to keep this trap around and use it again next spring when the big fat queen wasps (or yellow jackets) are waking up from their winter slumber, looking to start up a new home. 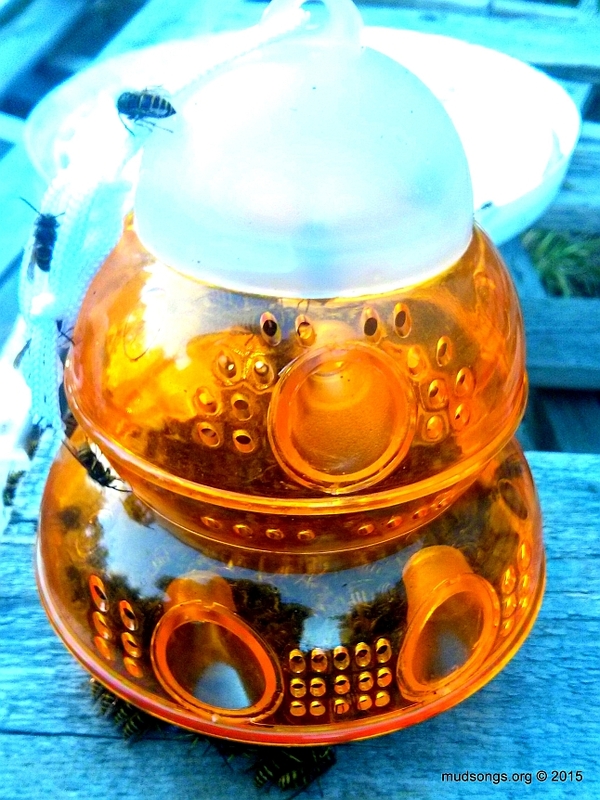 Here’s a quote from the instructions for the wasp trap: “Place the trap in early spring at first sight of yellow jackets or wasps to catch the fertile queen and prevent the formation of an entire nest.” I’m in love with this wasp trap. It’s the best nine dollars I’ve spent in a long time. 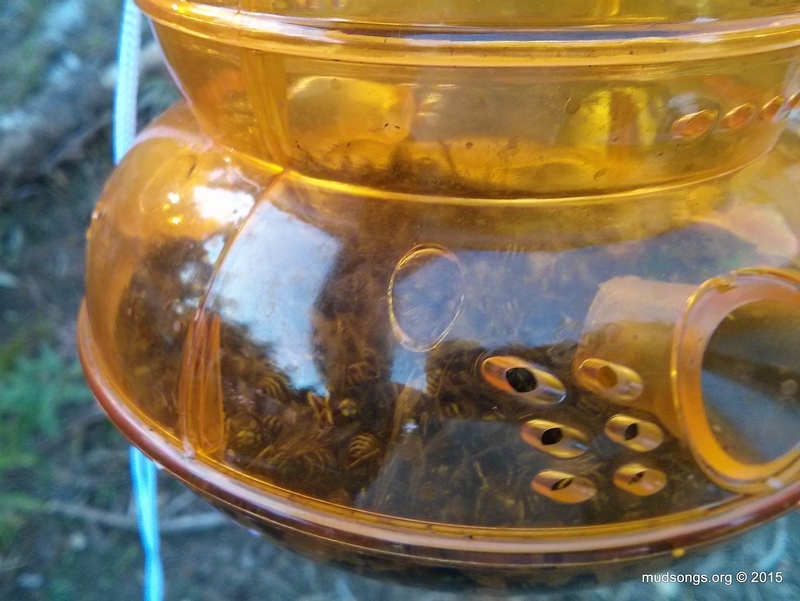 DAY 2 RESULTS: I noticed more honey bees going into the trap today. Their numbers are still small compared to the wasps getting trapped, but there are definitely more of them today. I’ll stop adding sweetened water to the trap. Perhaps just a dollop of jam will be enough. DAY 7: I was concerned the wasp trap could catch too many honey bees. It doesn’t. 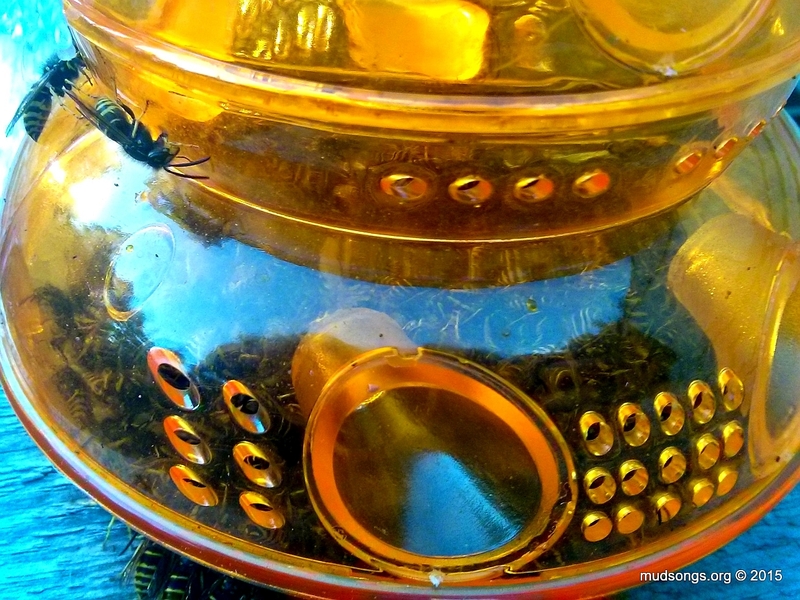 I noticed several honey bees attracted to the outside of the trap. A few got inside, but at the very most it may have been 10 dead honey bees to several hundred dead wasps over the period of a week. I have no problem with that. I had to empty the trap of dead wasps every day. Dumping out the dead wasps was a little on the gross side. One batch I flushed down the toilet. Another I dumped on the ground and then covered with dirt. Another batch was left in the trap for a few days and stunk like rotted meat. 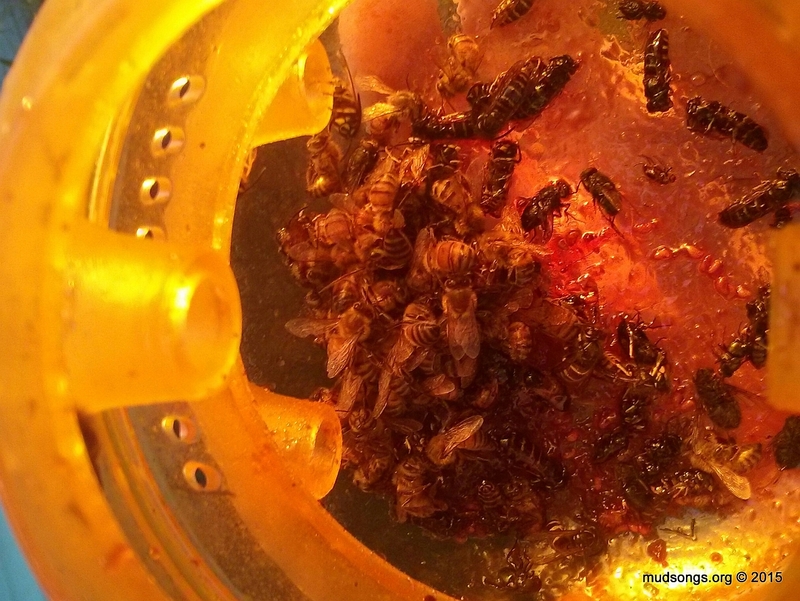 Using a hose, I filled the trap with water to make sure all the wasps were dead before I opened it up to dump it. The best time to do that seems to be early in the morning or at night when it’s cold and the wasps aren’t active. I will most definitely set this trap up next spring as soon as I see queen wasps or yellow jackets flying around. That’s not a catastrophic number of dead bees, maybe 20 or so, but there are even fewer wasps caught in the trap when normally the trap is almost overflowing with dead wasps after one day (provided it’s a warm day). I would say the wasp trap has done it’s job. 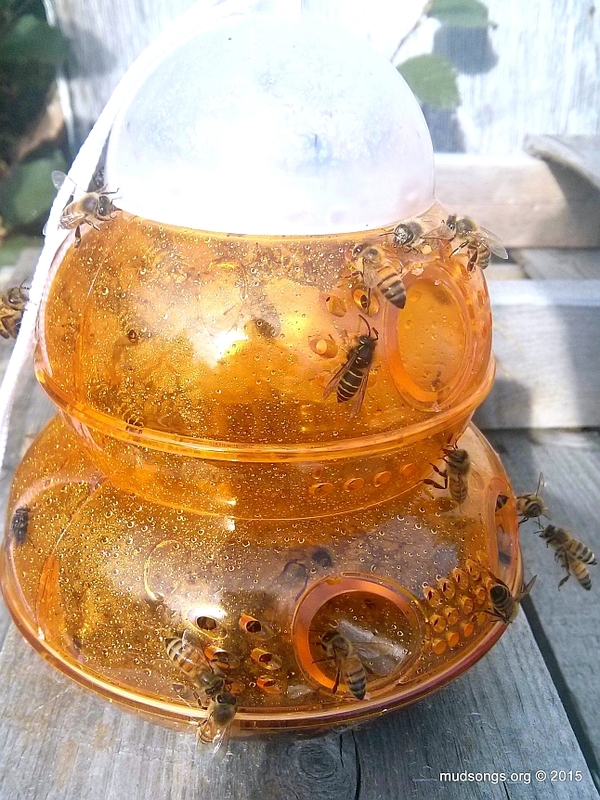 So let’s recap: I filled the trap with sugar water and some raspberry jam on Day 1 (September 22nd) and caught about 100 or so wasps within 24 hours. Maybe two or three bees got trapped. 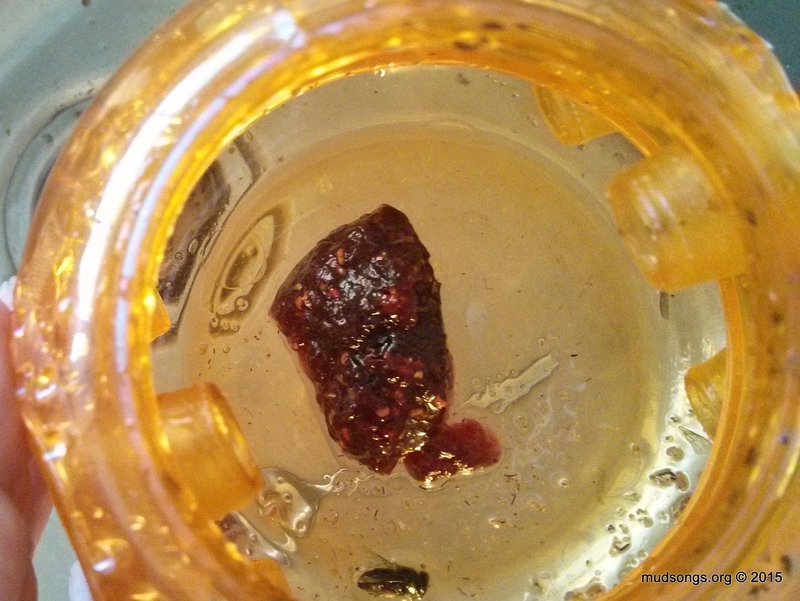 I continued to clean out the trap and refill it with a glop of jam whenever I could. The trap would fill with wasps within 24 hours every time. The number of wasps flying around my yard was noticeably reduced. The cold nightly temperatures could have been killing them off, but I’d say the wasp trap accelerated the process. The honey bees, desperate for anything sweet at this time of year, are making their move for the raspberry jam now that there aren’t as many wasps descending on the trap and getting in their way. Losing twenty or so honey bees to the trap every day is a negligible loss, but catching more bees than wasps, even if it is negligible, doesn’t sit right with me. So I’m done with the wasps trap for the year. Well done wasp trap. I’ll set it up again next spring to kill off as many queen wasps and yellow as I can so they can’t establish as many colonies near by beeyard. JULY 23, 2016: The wasp traps I put out in June when the queen wasps were plentiful didn’t catch a single wasp. I used wet cat food as bait. Nothing. I used various types of vinegar. Nothing. I may have used jam and vinegar, but never a sweet bait on its own. Still, nothing. I eventually found two effective methods, though: 1) I squooshed the queen wasps with my boot. I have an old plywood shed in my yard, the plywood dry and grey with age. I found the wasps by hearing them first, hearing them chew on the dry wood, wood particles they use for building their nests. I tried smacking them with various objects around my yard, but quickly discovered that pulling my boot or shoe off and whacking the wasp worked best. I killed three or four wasps after work every day for about week using the old boot method. 2) I also made use a high pressure pesticide spray container (the kind you have to manually pump to build up the pressure). I filled it with soapy water and blasted several wasp nests that were just beginning to get built around my house. I think I destroyed at least five of them. I soaked a few wasps on the side of my shed too. I expect to update this post again if the wasps make another appearance. Other tactics for killing wasps later in the summer can be found at Yellowjacket Traps from Honey Bee Suite. It has some info on a trap that uses a lure that only attracts yellow jackets. No risk of catching honey bees. This entry was posted in Diseases & Pests, Month of October, Month of September, Wasps & Yellow Jackets, Year 2015 and tagged Practical Tips. Bookmark the permalink. 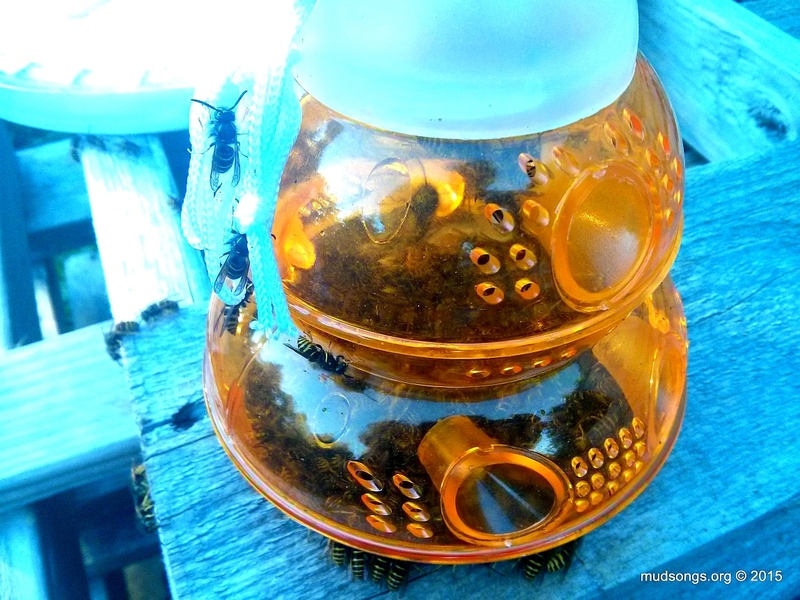 I just updated this post with some information on trapping queen wasps in the spring. Specifically, the trap doesn’t seem to work (so far) at catching queen wasps.